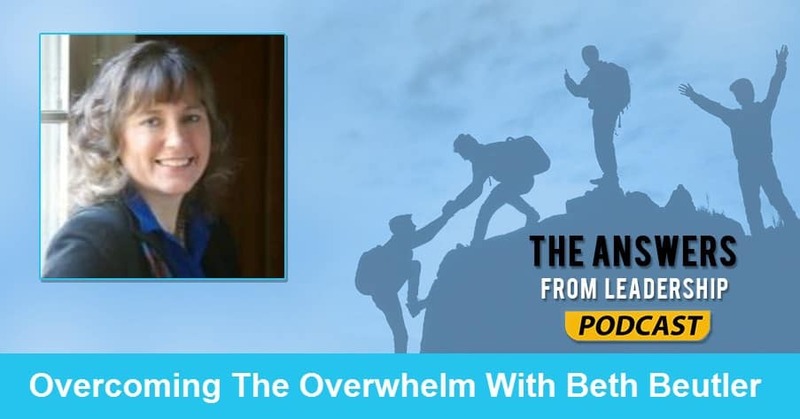 Beth Beutler is the guest on today’s Answers From Leadership podcast. Beth is virtual assistant, consultant, author, speaker. She helps principle-centered yet overwhelmed professionals excel. Today, we discussed overcoming the overwhlem, and becoming a more productive leader. What else would you have listeners know about you? In a very specific way, the roles I play are a collaborative virtual assistant, a business soft skills trainer, and a blogger and writer. I write on helping overwhelmed professionals excel. That’s where the name H.O.P.E comes from in my business name of H.O.P.E. Unlimited. I was also a long-time church employee. Why do you consider yourself a leader? I feel like I was born a leader in some ways. I was born an only child, married an only child, and am a parent to an only child. I think only children have to lead at a young age because they have to come up with their own fun and be creative. Then I’ve had positions in my career where I was placed into positions of management. And now with my own business, I feel like I lead myself! What difficulties have you encountered while leading? The biggest difficulty leading that I’ve had is one, I had to sadly be involved in some personnel issues that were kind of big. I’ve been on both ends of hiring and firing. The second difficulty is truly leading yourself, or I guess myself. I write about things overwhelmed professionals can do because I am one! What have you learned through those experiences? Let’s see… I guess it’s more that I’m learning. Last year October, I became a full-time entrepreneur. It’s just an on-going journey of learning what works for each individual person. What works for me won’t work for you. I have to adapt. Some people are totally hands off, others want a sense of control. Neither one is right or wrong, leaders need to adapt to those around them. 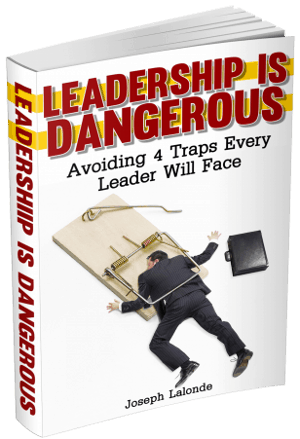 Why do you think leaders get overwhelmed? A lot of good leaders are creative people. They’re driven and have an idea. I think that there’s a drivenness in those that have the ability to start a ministry or an organization. I find the reason that we get overwhelmed is because we get our hands involved in so many things. We hear that we need to have a social media presence. Or that we should be growing and watching videos and constantly learning. We should be reading a book a week or a book a month. The question becomes: How do I find the time to read or go to networking events or sit and create things? Trying to be everywhere and do everything is overwhelming. I’ve been there as well. What can we do to lighten that load? Well, automation in life and business. It’s pretty important. Most of us feel that we have to have a presence on all the social media channels. Though some social media practices are to pick one or two and you truly engage on that channel. And the others you just throw content out there to have a presence. Do you have any tips on becoming a more productive leader? I think that we have so many distractions, there’s so much input coming into our lives through our cell phones and notifications, that if we could learn how to control those inputs and put it into one central place, it helps. We don’t need notifications popping up for every new email that comes in. We don’t need to know about the latest Facebook message. What do you wish you would have known about leadership 10 years ago? One thing that I’ve discovered as I’m leading my own business now is that leadership is lonely. There are times leaders have to shoulder decisions that are more difficult than they realize. Can you recommend one or two books to help a leader grow? Instead of a book, I’d like to recommend someone’s website. That website is letsgrowleaders.com. She’s a friend of mine and I really enjoy her writing. And she has written a book about getting along with your boss and one about managing without losing your soul. A lot of stuff by Michael Hyatt are also high quality. Including his podcast. EntreLeadership is also another podcast that brings on a lot of interesting business folks. Not only those, but some of your local business leaders can provide a lot of value. Do you have anything else you’d like to share with up and coming leaders? I mentioned this but I want to say this again: Every leader is also a follower. There’s somebody we follow, there’s somebody who’s an example for us. Where can listeners find you online? The best place to find me is bethbeutler.com. Everything is centralized there. You can find my social media channels on the blog. It’ll point you to those locations. I also have books on Amazon.